Using a long measuring tape, measure from one side of your home to the other. Then, set your ladder up next to the corner of your home and measure from the bottom of your home to the top. Multiply the width of your home by the height to get the square footage of that side. Repeat steps 1-6 for the other sides of your home. Add all of the measurements together to get the total square footage of your home. Since you won’t want to install siding over your windows or doors, you’ll want to calculate the square footage of them as well. Subtract the square footage of your windows and doors from the total square footage of your home. Add 20% of the final number to your total number in order to account for any mistakes you may make while cutting your siding. This number is the total area you’ll want to keep in mind when buying siding. 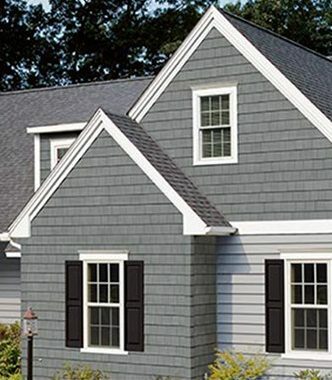 If you’re also applying siding to your gable, you’ll want to measure the square footage of this as well. Place your ladder in the middle of your gable. Measure from the bottom of roof/top of your home’s side to the peak of your roof. Write down the calculation, then divide it by 2. Multiply this number by the width of your home (#2 in the section above). This is the square footage of your gable and should be added to your original home area number.